Legislation that would prevent Americans from visiting websites the government claims are violating copyright rules had a tumultuous first hearing Wednesday, with its main sponsor unexpectedly expressing reservations over the bill's scope. 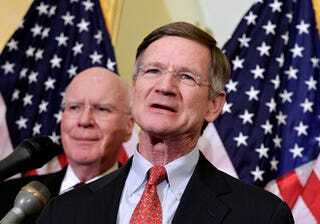 Rep. Lamar Smith (R-Texas), one the chief sponsors of the bill, expressed uncertainty over allowing the Justice Department to obtain court orders demanding that American ISPs prevent users from visiting blacklisted websites. ISPs receiving such orders would have to alter records in the net's system for looking up website names, known as DNS. The House bill also allows the Justice Department to order search sites like Google to remove an allegedly "rogue" site from its search results. "I'm not a technical expert on this," the chairman of the committee said, adding moments later: "I'm trying to ferret this out." When he introduced the package last month, however, he pronounced that the bill was needed because "Rogue websites that steal and sell American innovations have operated with impunity." In a marathon, 3.5-hour hearing before the 38-member House Judiciary Committee, lawmakers debated among themselves and with a panel of six witnesses, five of which favored the Stop Online Piracy Act. The committee took no immediate action, but it was apparent that the 79-page measure is likely to be amended, in no small part, due to a backlash from the tech community. Much of the package is similar to a stalled Senate measure known as the Protect IP Act. Both proposals amount to the holy grail of intellectual-property enforcement that the recording industry, movie studios and their union and guild workforces have been clamoring for since the George W. Bush administration under the theory that online copyright infringement is destroying American jobs. Smith, who said "everybody in this panel is committed to fighting piracy," noted commentary from internet security experts concerned over the fallout if the Justice Department begins ordering American internet service providers to stop giving out the correct DNS entry for an infringing website under the .com, .org and .net domains. Putting false information into the DNS system-the equivalent of the net's phonebook-would be ineffective, frustrate security initiatives and lead to software workarounds, according to a paper co-signed by security experts Steve Crocker of Shinkuro, David Dagon of Georgia Tech, Dan Kaminsky of DKH, Danny McPherson of Verisign and Paul Vixie of Internet Systems Consortium. "These actions would threaten the Domain Name System's ability to provide universal naming, a primary source of the internet's value as a single, unified, global communications network," they wrote. In other words, the bill would break the internet's universal character and hamper U.S. government-supported efforts to rollout out DNS-SEC, which is intended to prevent hackers from hijacking the net through fake DNS entries. The bill's big-pocketed proponents weren't moved by those arguments. Michael O'Leary, Motion Picture Association of America vice president, told Smith that, "it's a concern, but frankly overstated." Rep. Zoe Lofgren (D-California) whose district includes Silicon Valley, expressed alarm that Google was the only company invited to testify against the bill. Google was peppered over and again by lawmakers asking why it it doesn't simply stop rendering infringing sites in search results. "The search engines are not capable of actually censoring the World Wide Web," Lofgren said. "We need to go after people committing crimes." "We don't control the World Wide Web," she said, adding that Google does not know what sites are hosting infringing content unless the rights holder tells Google. When that happens, she said, Google usually stops displaying results pointing to that particular page within six hours. The MPAA's O'Leary countered later that, on a Google search, the in-theater-only movie J-Edgar has "a better chance that the Pirate Bay is going to end up ahead of Netflix" on a Google search. Google, Facebook, LinkedIn, AOL, Yahoo, eBay, Mozilla, the Electronic Frontier Foundation, the American Civil Liberties Union and a host of other groups and companies oppose the measure, saying the bill will break the internet as we know it. Not all members of the committee said the legislation needed work. Rep. Bob Goodlatte (R-Virginia) said, "This is a good bill." Rep. Mel Watt (D-North Carolina) expressed some reservations, but said legislation was needed. "Doing nothing is not an option," he said. "Not only are online privacy and counterfeiting drains on our economy, they expose consumers to fraud, identity theft, confusion and to harm." John Clark, the security chief for Pfizer, testified that counterfeit drug sales run rampant on the internet. "I see counterfeited medicines as attempted murder," he said. Troubling to Rep. Maxine Waters (D-California) was how the bill described what sites could be targed, those "dedicated to infringing activity." The House bill allows rights holders to demand that online ad services and credit card companies stop working with an allegedly infringing sites. The copyright holder need only allege the site is "dedicated to infringing activity" - as say Viacom alleges about YouTube, and if the ad service or credit card company does not quickly sever ties, they can be held liable. No court approval is needed to send such a letter. "It imposes harsh, arbitrary sanctions without due process," Google's Oyama said. Smith's measure also grants the U.S. attorney general sweeping powers to block the distribution of workarounds, such as the MafiaaFire plugin on the Firefox browser, that let users navigate to sites that have been blacklisted or had their domain name seized. Smith asked witness Maria Pallante, the U.S. Registrar of Copyrights, what she meant by her testimony that if "Congress does nothing," the "U.S. copyright system will ultimately fail." "I don't think," Pallante said, "that's an overstatement." It's not clear how the copyright system is failing given that the Netflix streaming service counts more than 21 million subscribers, accounting for the largest share of peak internet traffic every night; that YouTube is paying millions out to copyright holders; and an increasing number of people get their online music from paid and ad-supported services such as Pandora, Spotify, Rdio, Amazon and iTunes.